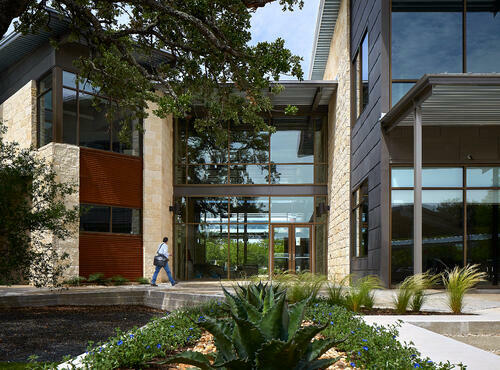 Mature live oak trees surround Joeris General Contractors’ new corporate headquarters in San Antonio, one of many elements that connect the Texas-grown company’s office to its Texas roots. The two-story, 40,000-square-foot building embraces the site, even the fabled Texas heat, creating a modern Texas building. The headquarters links the company to its Texas culture through native materials and a focus on linking the indoor spaces to the environment. “We wanted to integrate native materials and natural features of the site into the design, with a focus on providing views from workspaces to the oak trees in the courtyard,” says Mickey Conrad, Principal at LPA San Antonio. The new headquarters was a big step forward for Joeris, a 51-year-old company that has built its reputation on trust and relationships. Joeris’ operations were previously spread across several buildings and they wanted to bring its together under one roof. To connect departments, a second-story bridge in the new headquarters connects two wings of the building, linking the different corporate functions. The bridge opens the site to the oak trees and helps flood the building with natural light. “By having us all in this one large building with all the open spaces, it allows everybody to flow together again and feel more like one big family—which is what we want to be,” says Stephen Walter, Executive Vice President of Joeris. From the start, it was important to bond the headquarters with the company’s Texas heritage. The building’s façade is built around Texas limestone from local quarries and metal. “The materials let you know that it’s a San Antonio building,” says Conrad. Repurposed wood from the seats of a renovated historic stadium was used on the ceiling and accent walls. “The reclaimed wood gives the people of Joeris an interesting story to share about their space in San Antonio and their history here,” says Sara Flowers, Associate at LPA. Every aspect of the headquarters was designed to take advantage of the setting and the environment. Floor-to-ceiling windows capture natural light and balconies offer employees a quick fresh-air break. A 130-person training room and staff break room opens to a courtyard, shaded by oak trees, where social gatherings happen throughout the year. As part of Joeris’ commitment to promoting a healthy lifestyle for its employees, the headquarters integrates a staff café, bike racks and a fitness center with shower facilities. Fresh air intakes are included into the HVAC system to introduce a healthy amount of clean air into the building. The building was designed to LEED Silver standards and incorporates a variety of sustainable design elements, including a 72-kilowatt solar photovoltaic panel array allowing the building to save energy and operational costs. Vegetated bioswales carry roof water via perforated pipe, allowing it to infiltrate the soil before it is discharged off-site. Native vegetation was planted to reduce water demand. The design includes many ways to battle the Texas heat. The entrance of the building is screened, using pipe and perforated metal panels to protect visitors from the sun. Windows on the west and east facades feature shading devices to minimize solar heat gain, while maintaining views to enjoy the setting sun.